The first thing to know for those who want to go to Oktoberfest with children is that the stay under six years is generally allowed up to 8.00 pm: children in strollers must leave the stands before 6.00pm. On Sundays and holidays, children can arrive in the morning and stop no later than 2.00pm. Saturday is not included in these hours, but it is advisable not to bring children because of the impressive crowd. The administration of Munich, in collaboration with the planners of the festival, offers families the “Wiesn-Hits für Kids“, a brochure available throughout the city – tourist offices, the airport, the main station and the subway – which contains useful information to have fun at the Oktoberfest with your family. On the brochure are pointed out the most suitable places for children, the refreshment stands dedicated to them, specific services (for example, where to change comfortably your baby’s diaper), places where to leave buggies and strollers, the several playgrounds. Moreover, the guide itemizes all the scheduled events suitable for younger, because Oktoberfest is not only beer, but also shows, costume parades, marching bands, folk groups. So enjoy everyone, young and old! Photo by rochelle, et. al. 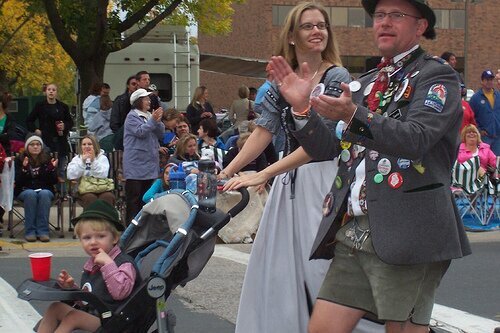 This entry was posted in Family & Kids, Oktoberfest and tagged Munich..
Nice post. I learn something more challenging on different blogs everyday. It will always be stimulating to read content from you. Thanks for sharing.